Despite their fearsome reputation, there are a lot of us folk in the reptile and wildlife fields who find the group of animals known as Brown Snakes (Genus Pseudonaja) to be an enigmatic, fascinating and, dare I say, beautiful bunch of animals. Perhaps it’s the large, black, forward-facing pupils with their fringing, crescent-moon iris, their amazing variation in colour, or simply their “take-no-nonsense” attitude that draws some of us to these awesome snakes. Even their name conjures an air of respect, with those early pioneers of Australian herpetology recognizing it’s potential tenacity by declaring the genus the “false-cobras”, ‘Pseudo-‘ meaning false, ‘naja’ being a genus of cobra and the name a South Asian cobra deity. 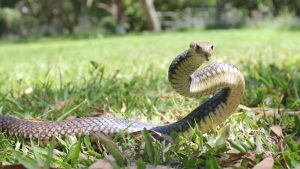 They certainly can display the defensiveness of a cobra, raising the body of the ground to bluff and strike while flaring out the nape of the neck, though not so obviously as the true cobras do. They are, however, initially very shy and alert, always looking for the nearest exit should someone try to pick a fight, but more than ready to defend themselves, an attitude which I find noble and deserving of some serious respect. Now not everybody has the same place in their fuzzy center for this venomous snake as I do. 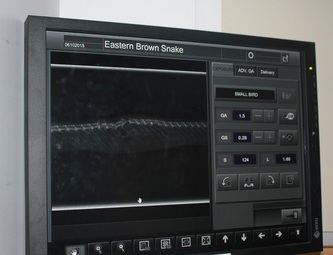 To be honest, I try my best to understand people’s negative attitudes towards snakes, since it is the very reason why many of us choose this profession; the brown snake, in fact most snakes, are often treated as targets for attacks by the less educated. Australia has a longstanding snake hatred, one which ignores their incalculable role in pest control, the value of which must be an enormous, tax free service for our agricultural industries, while also minimizing the deluge of introduced rodent feces/urine around our homes and drinking straw factories. Nice of them, you say? Yes, it sure is. 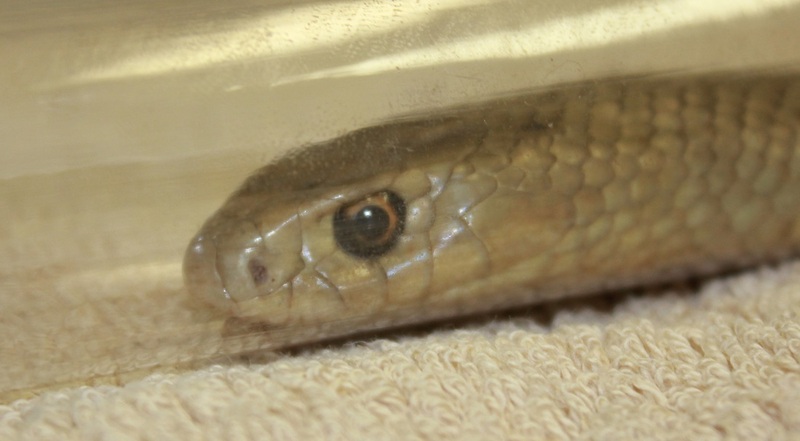 Again, these socia l and environmental contributions of snakes are often overlooked, nowhere more so than with the Eastern Brown Snake (P. textilis), common along Australia’s highly populated east coast, occurring throughout NSW and Victoria, most of Queensland and into South Australia and the Northern Territory. They can grow to over 2 meters long, though I’d estimate (my observation only) that the average is closer to 1.5-1.8m. Still, not a small animal, often the thickness of a mans wrist, and fast when agitated. They look tough and mean and invincible. NOTHING could be further from the truth. Like all snakes, the outward appearance of scaly, armour-plated sleekness disguises what is underneath. Snakes are, by and large, quite delicate creatures, particularly the elapids which tend away from gigantism and constriction. The aggressiveness which they display is exactly that, a display, an attempt to not get involved in a physical confrontation. 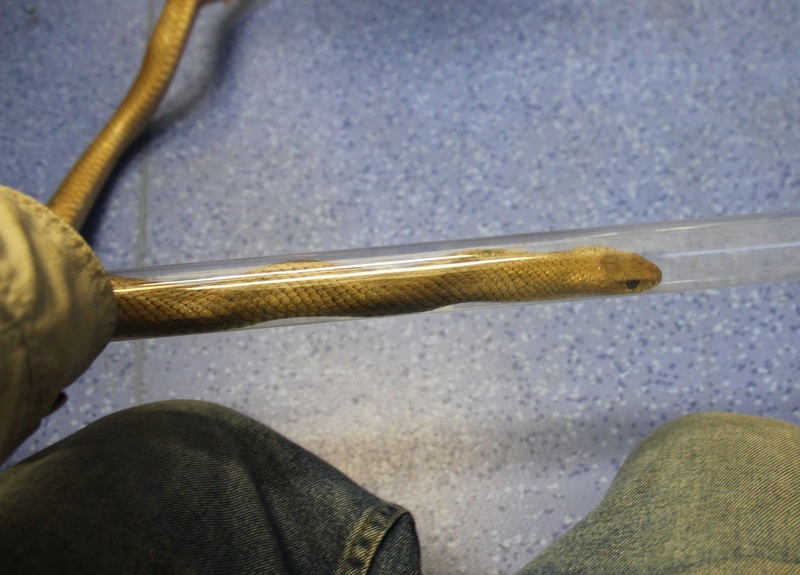 For while the snake may envenomate it’s attacker, it will likely get injured in the process. From the delicate jaw and skull bones to the hundreds of tiny vertebrae and ribs, all which can break and puncture internal organs easily with a blow or pressure, these animals are in fact not well suited for a fight. Nor should they be, for at no time in their evolutionary history was it significantly helpful to be anything other than a powerful predator of lizards, frogs, and rodents, while avoiding being food for large lizards, birds, dingoes, and other snakes. Sadly, accidents happen, and when they do these snakes usually suffer for it. Whether by ignorant people who let their fear and misunderstanding rule their judgement, or by rather more innocent canines who are simply territorial of their “property”, conflict usually means the death of one party. Guess which one? Surprisingly to some, the snake often comes off much worse. Through our work we often have the unfortunate task to hear or witness the barbaric actions of (mostly) terrified, middle-aged white men with a masculinity complex, or dog/cat attacks, or vehicle strikes, or even bird attacks, all of which demonstrate how delicate these animal’s bodies can be. 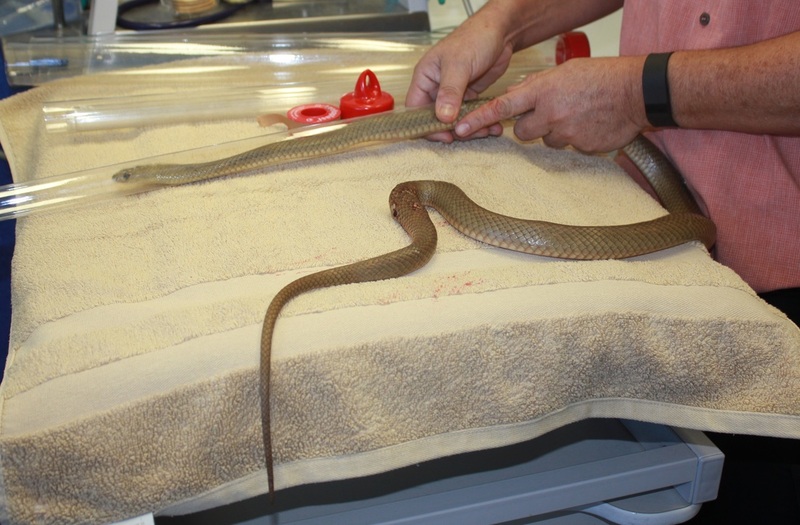 Take the following recent example; an eastern brown snake is on a property south of Brisbane. The residents see it venture to the neighbours’ yard where a small terrier dog ferociously chases it through the fence back to another property. Here’s where we come in. Upon finding the snake under the house by the garage entry behind some cardboard boxes, we see evidence of a dog bite about 10cm up from the cloaca. “Doesn’t look too bad” I think to myself. 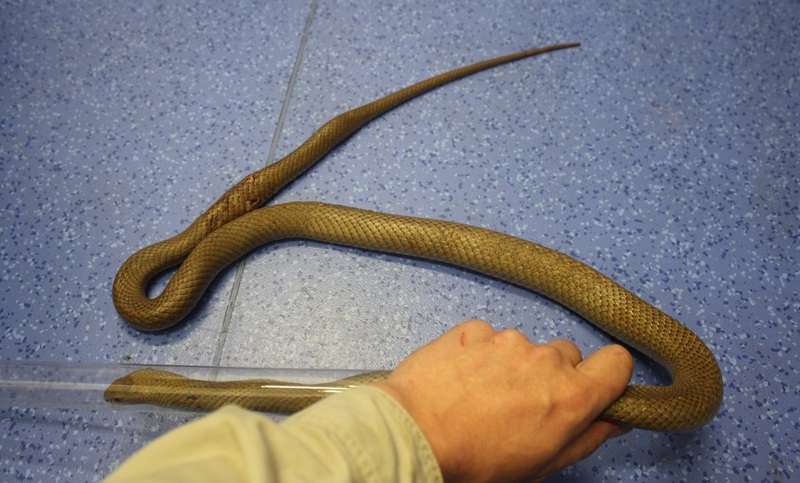 The tail, however, doesn’t display it’s typical mobility, and the bite area is swollen. While bagging the snake, telling the client to check on the neighbour’s dog, and I start calling a local wildlife vet. My hope was for no spine damage, just some tissue and scale damage which I could get assessed then treat at home in our rehab enclosure. 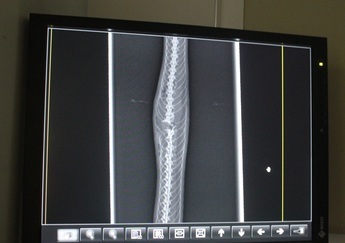 Once at the vet we get the snake tubed and have a better look at the injury, however the initial prognosis is not good. Sensitivity and mobility in the appears lessened. The bite site looks badly swollen and seems to be at an odd angle. 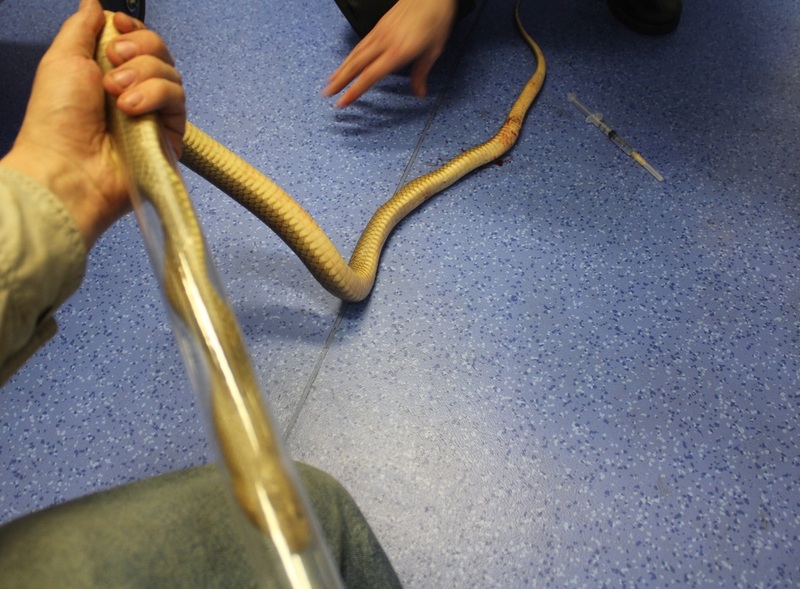 The snake is anaesthetised and an x-ray is taken. The results show a full break in the spinal column, meaning the nerve signals to control everything down from the brake, including lower colon, cloaca, reproductive organs, will no longer transmit. 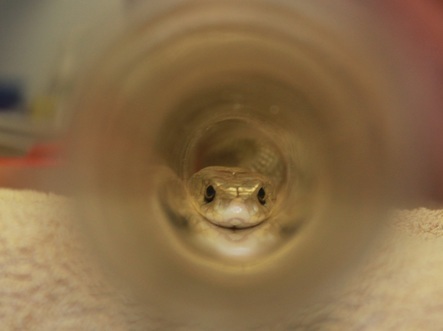 This snake would, in the wild, die a slow and presumably quite agonizing death. She was euthanized to end her suffering, which I imagine was significant. So much for tough, mean and invincible. Like all snakes they’re not designed for a cage match. 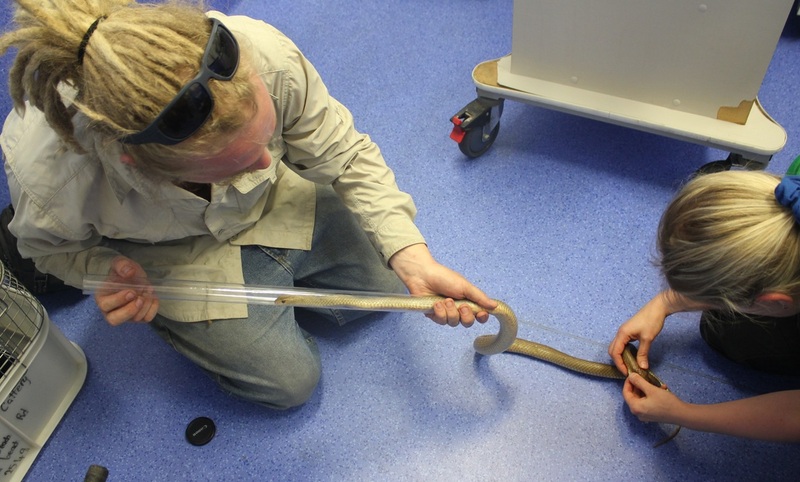 Even various snake catching tools, like the infamous snake tongs, can very easily break ribs, fracture vertebrae and generally cause compression to the internal organs. So, those fools who like to attack snakes with garden tools, sharp objects and rocks, well they start to seem a little less than tough themselves, don’t they? In fact, when you consider that the snake probably weighs less than 1% of the towering human attacking it, I’d go further and say that they’re heartless, ignorant cowards. The case described above shows you just how big and strong people prove themselves to be in dispatching one of these creatures; about that of a small terrier, and about of the same level of intelligence. Oh and they may also, like the unfortunate terrier, get bitten once in the process and thus display their intellect for the judgement natural selection! You may have detected a subtle note of displeasure in this post. Please be assured that this is not towards any particular dog, cat, or client. Dogs have instincts to be understood and accepted just as snakes do. I suppose my ire has been raised by the few calls this week, like every season, where I’ve attempted to talk someone down from killing the snake currently in their backyard (one such case was a carpet python up a tree! ), often successfully, against a torrent of fear and anxiety. 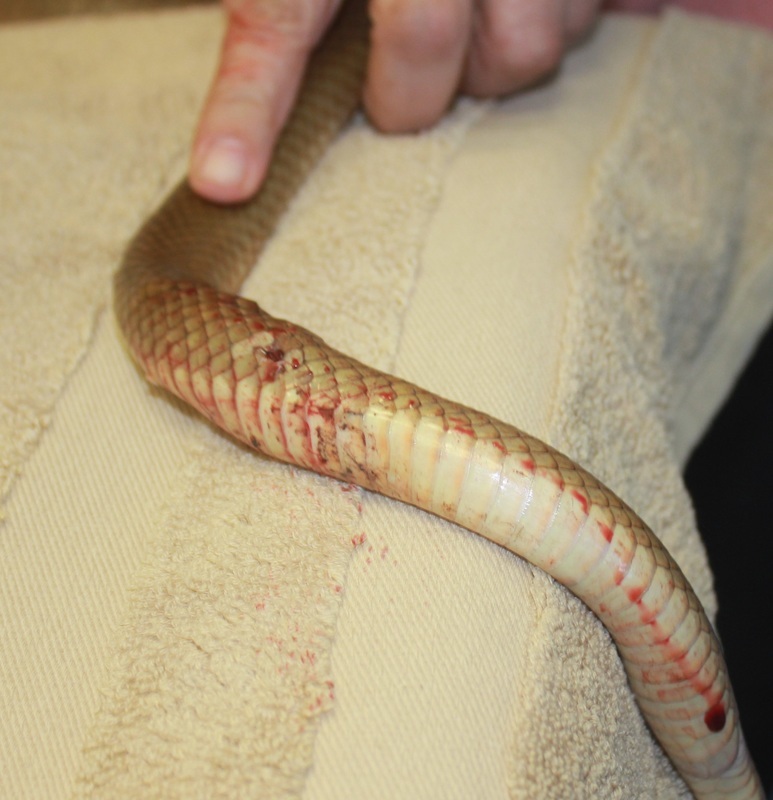 To then see what a small pup can manage to do to a one meter brown snake in one bite, well…let’s just say it makes those folks who believe it’s the tough, macho, Aussie-male thing to kill these snakes seem like folk I would rather not know, or know exist. But we talk, we try to educate, we try, and we try again, until the message sinks in or we expire. That, or euthanize me now. Let’s have a better day tomorrow. Visit our Homepage for more information. Your SnakeOut Brisbane.